Recently there’s been a resurgence of interest in ’70s-inspired apparel. Have you noticed it? Witness the recent Yves St. Laurent show (now on its way to the UK! ), and the new Yves St. Laurent + Halston exhibit. It’s all over the runways right now and making its way into your closet, I promise. You may not be aware of it yet, but it will find its way to you eventually. I talked about fashion trickle-down recently in my column for Sew News. I’ve also been seeing a lot more safari-inspired clothing, which makes me happy. When I was designing at Tommy Hilfiger I started collecting catalogs from the original Banana Republic company because I loved the look so much. I wanted to do something along these lines in the new Lisette collection, and that led me to the skirt with Lisette B6182. A few things I like about this pattern: I love the high waistband. You can’t see it in the photo because the top covers it, but it’s a tall waistband that will give you a nice defined waist and a long line. It will also give you a little more coverage if you decide to pair it with a slightly cropped top, so you won’t need to worry about showing more skin than you intended. But if you prefer a regular zipper, that’s a really easy change to make, too. As you know, I love a nice invisible waistband, so we included that too. And of course there are those applied pockets, which give it a nice sportswear feeling and are so easy to make. Leave them off if you want the skirt to be dressier, but we all like pockets, right? And these won’t add any unwanted bulk or width to your profile. Both the ’70s and the safari look inspired this new a-line Lisette skirt, B6182, so I thought it would be fun to give you some fabric and styling inspiration for this style. You can find many more images and ideas in my Lisette Pinterest board, too. For a dressy skirt, choose fancy fabrics like silk dupioni or shantung. This skirt is obviously part of a dress, but I love the versatility of a more formal-style skirt like this. You could pair it will a blouse (the blouse from the pattern, made longer, would be really cute tucked in) for dressy occasions, but you can also tone it down with a more casual top, like a T-shirt. Classic black! In twill for everyday, or in wool suiting for a skirt that will go with absolutely everything. This skirt is styled a little bit tomboy, which I love. Simple styles like this pattern work really well with patterns and prints. The chevron print has been a bit overdone lately, but I think this skirt demonstrates how you can play with patterns and get lots of great results for a whole wardrobe full of fun skirts! Dressy version, see 1, above. If you prefer a more feminine look, polka dots can give a tailored style like this pattern a bit of feminine charm. This cute floral skirt from Boden is another great example of how the pattern will work with lots of different printed fabrics. White: sewn in twill or suiting for summer. In heavier wool or even leather (like this one) for winter. Shorten the skirt and sew it with suede like this version from Derek Lam for a little bit of a 70’s vibe. Love the mustard yellow color! This would be a great addition to a core wardrobe and is similar to number 8, above. Again with the fancy party skirt. Bright bubble gum pink for a really girly version that totally works with this more conservative, tailored cut. White twill again. Goes with everything, great transition piece for spring and fall too. Right now I’ve got a huge design crush on Tomas Maier–both his self-named collection as well as his work with Bottega Veneta. This is yet another example of his very wearable aesthetic. This is how I want to wear this skirt. It’s classic but worn with a little bit of a contemporary edge. Tomas Maier again. Witness the safari-inspired look. I love the topstitching done with a darker shade. Here’s another example of a dressy pink a-line skirt. I think this one might actually be culottes, but you could get a similar look with the a-line skirt and silk faille. Isn’t it great worn with the casual T-shirt? This blush-colored suede a-line skirt pushes all the right buttons for 70’s inspired style. I visited a Jo-Ann store yesterday and spent more time looking at all the great home dec fabrics than any fabrics in the apparel section. All the best prints and more substantial fabric weights (i.e., fabrics appropriate for skirts and jackets) are in the upholstery section, where you could easily find something similar to this cute floral skirt. Slubby heather gray gives this skirt an interesting texture, and I love texture in apparel. It’s so easy to pair a skirt like this with simple tops and skirts for an grab-and-go outfit that doesn’t require a lot of forethought on a busy morning. Here’s a very classic skirt. It’s dressy with a little bit of a safari vibe. You could base a whole wardrobe around this skirt and wear it nearly every day. And the crepe fabric looks so elegant. This vintage-inspired chevron skirt has the pattern woven right into the (jaquard) fabric, which gives the fabric a bit of texture and pattern. 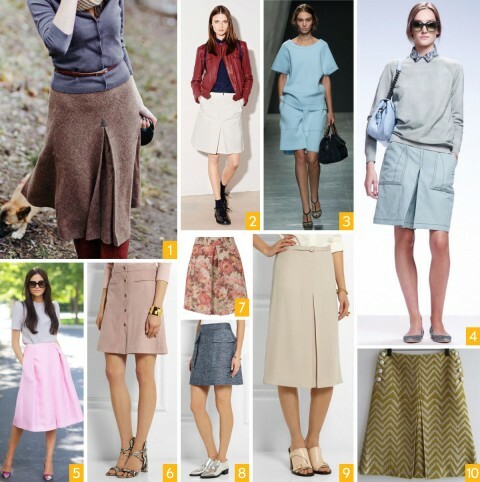 Again, a really easy skirt that will pull together a great outfit with very little planning. Personally, I think I might sew myself an indigo skirt similar to this one, which I know I would wear all the time. How are you planning to sew it? 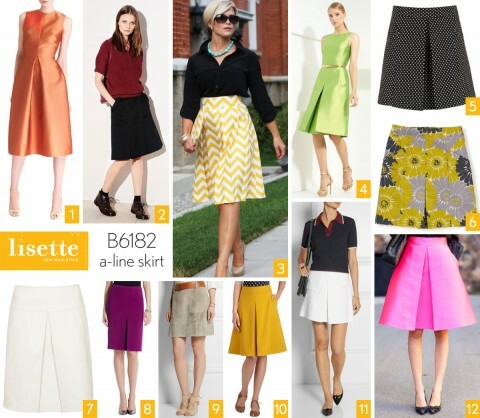 Don’t forget: more images and ideas on the Lisette Pinterest board! I am having huge problems deciding on what size to make for this. The waistband has me baffled, to be honest. I picture a high waistband as starting at the natural waist and fitted – right? But this waistband has a mark partway up for the waistline, and if sewn at a 5/8″ seam, the measurements give a depth of 1 1/4″ below the waist. which in most cases will be larger than the natural waist… In fact, the measurements given on the waistband are 3 1/2″ larger than the pattern waist measurements, which would work for being that much lower than the natural waist. BUT this would mean that the band would stand out like a cube. Shouldn’t it have a bit of a shape? Or be smaller so as to fit at the natural waistline? In my case, I have a very pronounced waist, and always tend to have this problem with waistbands anyhow – so I either make them narrow or use facings or pick a skirt size which fits my natural waist with half an inch of ease and use the waistband size for that – this works, if I want a wider waistband. Problem is, if I use a waistband size which fits my natural waist (size 16 would give me the perfect 33 1/2″ waistband), then I worry that the hips won’t have enough ease, since mine are 44 (I would have made a size 20 and drafted down a little for the waist) – the hips for the 16 are 45, which only gives me one inch of ease. So – my question is = do you think if I grade from 16 to 18 at the hips, which has a 47″ inch measurement, 3 ” of ease are enough to retain the pattern aesthetic? It;s just that when I try to grade from the 20 to the 16 I cannot get a nice curve and worry it will look ridiculous and spoil the style. Some kind of a reply on how to deal with this particularly strange drafting would be nice! Francesca, I see that you’ve also posted your query on the forums (which is a perfect place for questions like this) and received an excellent reply from Nicole. Beyond that, I would suggest that you compare your hip and waist measurements to the size chart and select the larger of the sizes. You’ll want to make a muslin, and I would also suggest checking the finished measurements to help you determine how much ease you want in your finished skirt. With regard to the pattern itself, I don’t think there is anything “particularly strange” about the drafting. 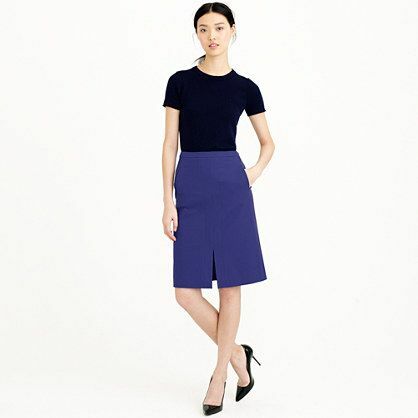 It’s a straightforward A-line skirt with a wide waistband that hits at the natural (high) waist. If it was designed to be a very tall contoured waist it would have shaping. I would also suggest investing in a copy of “Fit for Real People,” which is a great reference guide for fitting clothing. Thanks Liesl – I posted on the forums after this when I realised it was a better place but couldn’t delete this. I will hop off and see Nicole’s reply, but I really don’t think that 3 inches of ease are suitable for a high waisted waistband at the high waist – that is my main problem.